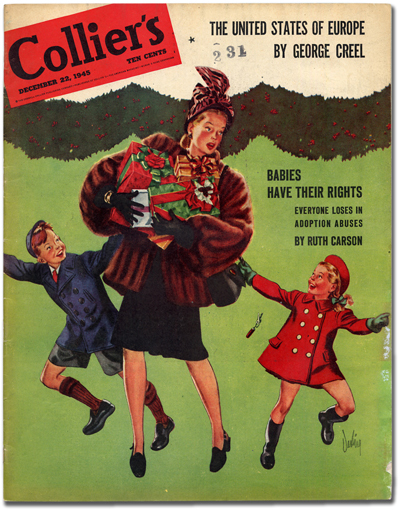 Holden Caufield’s first appearence in print was in a short story ‘I’m Crazy’ published in Collier’s Magazine on 22 December 1945. It was about eight o’clock at night, and dark, and raining, and freezing, and the wind was noisy the way it is in spooky movies on the night the old slob with the will gets murdered. I stood by the cannon on the top of Thomsen Hill, freezing to death, watching the big south windows of the gym – shining big and bright and dumb, like the windows of a gymnasium, and nothing else (but maybe you never went to a boarding school). I just had on my reversible and no gloves. Somebody had swiped my camel’s hair the week before, and my gloves were in the pocket. Boy, I was cold. Only a crazy guy would have stood there. That’s me. Crazy. No kidding, I have a screw loose. But I had to stand there to feel the goodby to the youngness of the place, as though I were an old man. The whole school was down below in the gym for the basketball game with the Saxon Charter slobs, and I was standing there to feel the goodbye. Stephen at Booktryst has a full post on the story. This entry was posted in Blog and tagged J.D. Salinger by James. Bookmark the permalink.